HomeDeck Finish – Clear, Solid or Semi-Transparent Stain? Deck Finish – Clear, Solid or Semi-Transparent Stain? When I get a call to bid a deck staining job, often the homeowner asks me my expert opinion on whether to use a clear, solid or a clear semi-transparent stain. It all depends on the level of maintenance and investment you are prepared to commit to over the years. Clear finish deck stains only last up to two years. In most cases your deck will look the same after power washing when you apply a clear finish. Some clear sealers may have a hint of color. The advantage of a clear stain is that after several years the sealer will be gone so prep and re-application is simple. Just power wash and apply clear again. Semi-transparent deck stain can last about three years. When the semi-transparent stain wears off you must apply a stripper, then a cleaner before power washing the deck clean to prepare the surface. In most cases, a semi-transparent stain will give the wood deck color. This option is more costly to keep up due to the extra prep work needed. 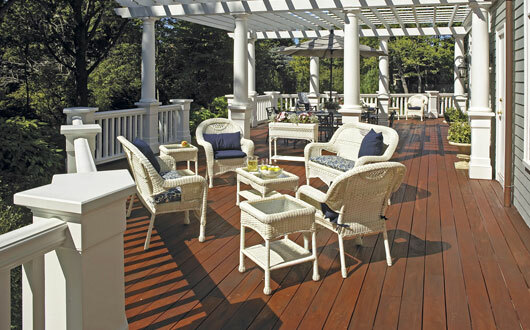 Solid stain deck finishes will give you a solid color just like paint but with much less sheen. Solid stains last around five years. To re-do a deck with solid stain, manufacturers always recommend you completely remove or strip all stain first. If the solid is peeling, you will need a professional painter to determine the correct application process. Some times you may be able to avoid stripping the deck by power washing and re-coating with the solid stain. But in some cases for example, the deck floor may be peeling profusely so you will need to strip and apply penetrating oil, then re-coat with the solid stain. Decks stained with a solid experience more peeling than semi-transparent or clear stained decks thus requiring additional maintenance. At O’Connor’s Painting Service we recommend products such as Cabots, Sherwin Williams, Benjamin Moore, Behr or McCormick stains. Your deck stain will last longer with a professional application with a top rated product. ← Trying to Decide between Power Washing or Hand Cleaning Painted Surfaces? We recommend and use Cabots products and give an overview on how to stain a deck in this posting on our blog. This picture is an example of what Cabots products look like properly applied. In no way are we claiming the picture to be that of an O’Connor’s Painting Service customer. However, we are confident that with our knowledge of Cabots products and deck staining, your deck can have the same quality finish.